Support our Class! Any size contribution would be greatly appreciated. 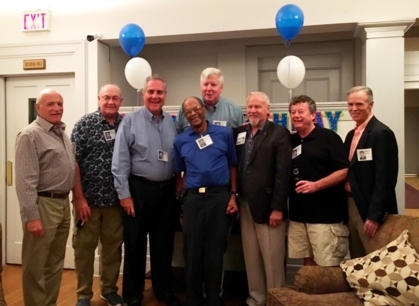 If you would like to support the Montclair High School Class of 1964, please click the Donate button below. Donations can be made by PayPal, or with a regular credit card if you do not have a PayPal account. PLAN AHEAD . . . Please make your housing reservations now to ensure availability. Local options can be found under the "55th Reunion" drop-down tab atop of this page. Don’t wait “until the next one” as we sadly are losing classmates too often now. In addition to the party on Saturday night, the Reunion Committee has decided to hold a Friday night gathering at Tierney's similar to the one held for the 50th reunion- a private party in the upstairs area with a buffet included. We will also be giving all attendees a list of Saturday activities being held around town. You will be receiving notifications as the weekend details are firmed up. Can you guess who these guys are? Everyone who attended our 70th birthday party knows. If you don't know who they are, come to our next reunion and find out!! Go to Past Reunions-70th Birthday Party- for more photos. And please send in any photos you may have taken.